A Girl Walks Home Alone at Nigh highlights Persian flavors. When a horror film is called A Girl Walks Home Alone at Night, we’re trained to think the girl in question is the one facing the dire threat. But in Ana Lily Amirpour’s 2014 debut feature film, the girl is the the predator, not the prey. The nameless young woman, played by Argo actress Sheila Vand, wanders the nighttime streets of a fictional Iranian town called Bad City, populated by pimps, prostitutes, punks and junkies. She’s draped in a black chador which can make her appear anonymous or ominous, depending on the situation. We learn early on that the girl is a vampire, and we see her savagely dispatch the local pimp, the first of several killings that make us wonder whether she’s simply quenching her thirst for blood or acting as a feminist avenger. When her path continues to cross that of the film’s protagonist, a small-time hood played by Arash Marandi, a new question haunts us: Does she actually have feelings for him or is she toying with him, amusing herself before the kill. Amirpour does a great job humanizing the vampire without explaining too much about her. The girl’s ’80s-inspired clothing, the teeny-bopper posters on her wall and the synth pop she plays on her record player hint at who she was before she became undead. And those trappings also help us understand she’s more than just a murderous apparition. Be careful of what lurks beneath the chador in A Girl Walks Home Alone at Night. The movie’s stark black-and-white photography and effective use of silence probably owe as much to the influence of Iranian New Wave cinema and early Jim Jarmusch as they do F.W. Murnau. A creepy atmosphere pervades, but the movie isn’t without humor. The vampire girl acquires a skateboard and uses that to glide along the street for much of the film, and we catch occasional glimpses of street signs warning motorists to watch out for women in chadors — an image that takes on a double meaning here. A Girl Walks Home Alone at Night doesn’t deliver the kind of bump scares and roller-coaster thrills of a Hollywood-style horror film, but it’s refreshingly clever in the way it humanizes its monster and draws us into a dream world that borrows details from horror, Spaghetti Westerns and art house cinema. That’s why it’s the inspiration for this week’s cocktail. Lime, cherry and rosewater are all ingredients that figure prominently in Persian cuisine, and they all figure prominently in this cocktail. The cherry is doubly appropriate here because of a Persian saying that we taste cherry when we die. Our final reflection on life is that it’s been both sweet and sour. 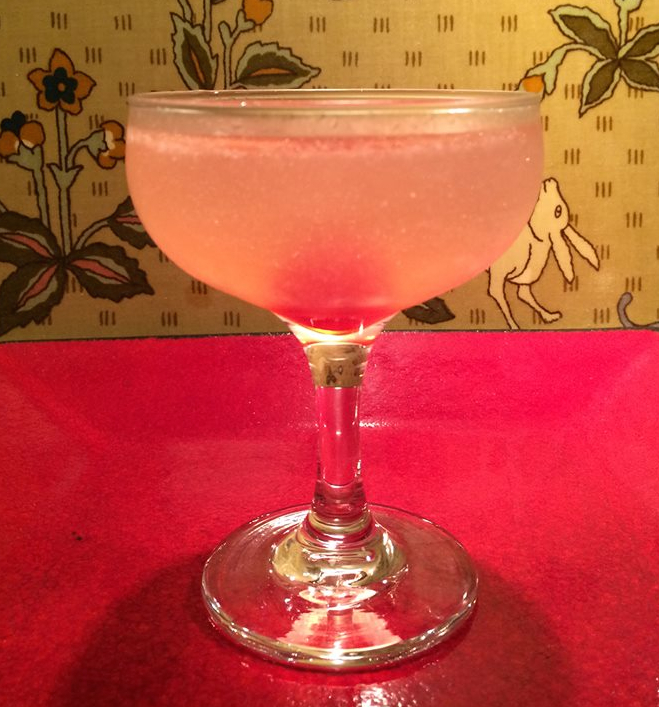 The cherries’ sourness is augmented by the lime in this drink, while the gin and rosewater lend an aromatic dimension. Like its namesake movie, this cocktail is refreshing and complex without being cloyingly sweet. Shake all the ingredients, except the cherry over ice. Place the cherry and a little of its syrup in the bottom of a chilled coupe glass then gently pour the mixed cocktail over top, allowing the red syrup to drift upward like drops of blood.